Relocating is stressful enough on your employees: finding a new house, new schools for the kids and more. But what about Spike, the families’ Labrador who hides under the bed every time someone closes the bathroom door a little too hard. Imagine getting him safely from California to the transferee’s new home in Canada. There is more to it than buying Spike a plane ticket for a one-way trip to Canada. The employee needs to have the right size crate, and Spike needs to have certain shots and documentation for his destination country. These factors all play a big role in getting the family’s pet safely to their new location. We talked with Andi Parker, owner of Air Animal, a family-owned pet relocation service with 38 years of experience in the pet moving industry. Parker offered some tips to share with your employees who have a dog, cat, or even snake that your transferees will be bringing with them to their new home. Having the wrong size crate can prevent your pet from being able to fly. The travel container needs to be large enough for your pet to be able to stand up, sit down and turn around comfortably. There needs to be a 1- inch clearance from the top of the pet’s head, or ears if they are pointed, to the ceiling of the crate for domestic flights and a 3- inch clearance for international flights. Air Animal suggests getting your pet used to the crate by taking short trips around town with your pet in the crate or driving through an automated car wash several times to simulate the noise and minor turbulence experienced during flight. 24-48 hours prior to the flight: Fill your pets’ water dishes 2/3 full of water and freeze 24 hours prior to flight. If you don’t have time or the opportunity to freeze them, fill the dishes with ice cubes for your pet to lick for hydration as they slowly melt. The day BEFORE the flight: Feed your pet ½ of his/her normal meal. On the day OF the flight: No Food- Give Water Only. Healthy adult pets should travel on an empty stomach. (With the exception of young puppies or kittens- you should consult your veterinarian for feeding advice). Nothing in means nothing out. There is less chance for an upset stomach or need to soil the kennel. On the day AFTER flight: Feed your pet ½ of his/her normal serving for the first meal. Resume your pet’s normal feeding schedule thereafter. Depending on where your employee is moving to, each country has regulations for taking pets across their borders. For example, Australia is a rabies- free country so there is a period of quarantine after your pet’s rabies shot before they are allowed in the country. This process can take several weeks. There are pet regulations domestically as well. For example, your employee moving from North Carolina to downtown Chicago might have a hard time renting an apartment that will accept their particular breed. Make sure your employee has visited the country’s website or has talked with their landlord to view the rules and regulation of bringing in a pet. Your relocation management company can help guide your employee to make sure their pet will meet all qualifications for traveling. This certificate provided by your employee’s veterinarian confirms that their pet is healthy and safe for travel. It will typically need to be issued 10 days before the trip, depending on the destination. This document shows proof that their pet is current on its rabies vaccination. Copies of all health documents should be placed inside the airport provided plastic pouch and secured to the top of the crate. 3. Thank you for choosing ____ for your air travel. Your employees needs to know the importance of choosing the right airline for their pet to fly with. A lot of airlines now have climate controlled areas for pets before, during and after the flight. They have dedicated staff members who will check in on the pets flying with them and make the pet a priority to get on and off the plane to the correct pick-up area. Be sure to call the airline your employee plans to use at least a month in advance to find out their most up-to-date pet traveling policy information. Small dogs (Chihuahuas, Pomeranians, Yorkies, etc.) and very small cats will generally fit under the seat in front of you. Pets must be able to stand up comfortably in their carrier in order to travel in the cabin. Airlines have restrictions on the transport of “mushy-faced breeds” or brachycephalic breeds like English Bulldogs, Pugs, Pekinese, etc., during the summer months and some airlines won’t fly them at all. Since dogs cool themselves by panting, these breeds of dogs have a difficult time being in hot weather because of their face structure. Here are a few more tips Parker has for when your pet is traveling for your relocation. Place an old T-Shirt or towel inside the flight kennel or Sherpa bag with your pet. Wear or sleep with the garment for several days prior to travel to assure your “personal body signature” is well saturated within. (Do NOT put toys or leashes inside the kennel, keep them in your baggage. If you have an extra anxious dog they may wear a DAP (Dog Appeasing Pheromone) collar or wear a Thunder Shirt. Cats can also wear a Thunder Shirt or you can use FELIWAY (Pheromone) Spray on a towel. NO TRANQUILIZERS PLEASE! Tranquilizer drugs decrease respiratory function and breathing difficulties may occur. Adverse drug reactions may occur due to drug sensitivity. A pet given tranquilizers is more likely to develop respiratory problems. 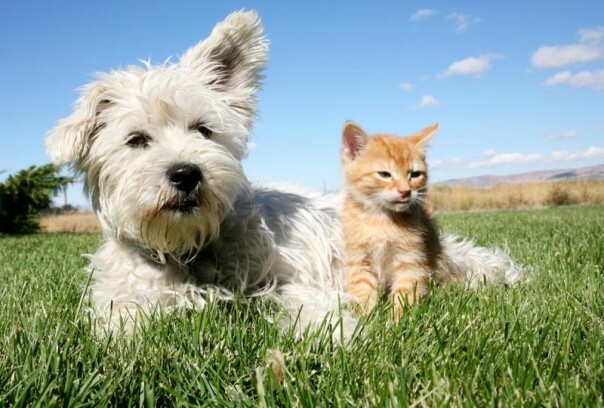 The pet cat or dog needing tranquilizers to fly – should not fly. Alternatives are available. The American Veterinary Medical Association strongly discourages the usage of tranquilizers or sedatives for scheduled airline animal transportation. Do not endanger your pet’s safety, health, and welfare as you travel or relocate. Of course, reputable pet movers help the family and Spike through this whole process, including arranging for transportation and crates, but not everyone has the resources to use a pet mover. If your company does not offer pet relocation services to employees in your company’s relocation policy, you can let your employee know that pet moving expenses are tax deductible. Like Parker from Air Animal says, “Your move is not complete without your pet; they are a member of your family.” Your employee and their family will feel more at home once Spike the Lab has joined them, which will lead to a happier family and help your employee transition into their new position more easily.